Cabinets of the Desert is a cabinetry company. However, its principals have been as successful re-modelers and builders. We have a keen understanding that cabinetry is only part, albeit an important part, of an overall remodeling or building project. A remodeling project must necessarily work within the constraints of a given structure, which may or may not be modifiable. So we and your interior designer or remodeling contractor work on and with the work of the architects and designers who preceded us. In doing this we apply accepted design elements and principles. A great deal of good design is simply intuitive. Most of us have a sense of “what works.” There is a good reason for this, since important parts of design are founded in the natural order we see around us. So our brief explanation here of Design Elements and Design Principles is offered as an additional reference to help our cabinetry clients bring rhyme, reason and the “music of the spheres” to their design decisions. • Design Elements are the basic tools used in creating and filling space. • Design Principles are a guide to the use of these tools. These elements and principles have been discovered, developed and refined since historical times and are used by anyone creating a visual effect. Painters, sculptors, photographers, interior designers, industrial designers, architects, fashion designers, landscape designers, and remodelers alike employ these principles. Design elements are space, shape & form, mass, line, texture, pattern, light, and color. Space is an area designed for a particular purpose and is 3-dimensional, having length, width, and height. To be pleasing a home needs both large and small areas. Equally, there needs to be a balance of filled space and empty space. Areas such as traffic paths are empty space. Depending on how furniture is arranged, a room can be made to appear large or small. Differently sized spaces can impart positive or negative feelings. For example a small room can feel cozy but if overcrowded with “stuff” can feel cramped. Equally a large room can feel airy or stark, depending on how it is furnished. Color also has a great impact on how space is perceived. Light colors make a room appear larger. Dark colors can shrink it. Shape is the 2-dimensional outline of a 3-dimensional form. Different shapes have different effects. For example curved shapes appear soft while rectangular shapes appear edgy. It is important to use shape and form in such a way as to complement the intended mood of the design. Mass is the apparent density of an object. Just as in physics objects with great mass attract other objects towards them; in design the perception of mass in an object is how strongly the eye is pulled towards it. Mass in this sense is visual weight, the ability of an object to draw attention to itself through line, form, color, and texture. Line creates width and height, or the appearance of activity, movement, or flow. Lines draw attention and convey feeling. Vertical lines impart dignity and formality. Horizontal lines impart security and calm. Long curved lines tend to relax. Short curved lines tend to excite. Diagonal lines bring drama and tension. Texture is the physical feel or surface appearance of an object, furnishing or treatment. It is more felt than seen and is important in the creation of mood, interest, and variety. Pattern is the orderly arrangement of forms. Light is critical to residential design, whether it is general lighting, task (focused) lighting, or accent lighting. Lighting can affect the appearance of shapes, colors, textures, and patterns. Color is the most noticeable of the design elements and has a major influence on the appearance and feel of a room. Light colors make it appear larger. Dark colors make it appear smaller. Warm colors (reds, yellows, oranges) add excitement to a room. Cool colors (blues, greens, purples) make it restful. Neutral colors are black, white, beiges and browns. Everyone has a favorite color but should be aware of its effect. Design principles relate to unity, harmony, balance, emphasis, rhythm, scale and proportion. A home is a totality, the sum of its component spaces. It is important that a common theme or style runs through it. Color schemes are an excellent way to create a theme. Harmony is the creation of an appealing whole through a variety of unifying elements and objects, such as, for example, a collection of Asian artwork displayed though the house. Balance is the creation of equilibrium in a space by the placement of objects according to their mass or visual weight. There are three types of balance: symmetrical, asymmetrical, and radial. Symmetrical balance is found in traditional interiors with the repetitive placement of identical objects. An example would be the placement of two identical candelabra in opposition from a central point. Asymmetrical balance is more casual and interesting where the mass of an object is balanced by another object or objects without duplication. An example would be a sofa balanced in opposition from a central point by a pair of chairs. Radial balance is where there is a central focal point with other elements arranged around it. An example would be a round dining table with chairs around it. An emphasis or focal point is what dominates a room and first draws the eye. This could be a piece of artwork, a chandelier, a fireplace, an aquarium or a view through a window. There is usually only one focal point in a room. Rhythm is what draws the eye, first to a focal point in the room and then to other components. Rhythm creates a flow of visual interest from object to object and room to room throughout the home. The “rules of rhythm” are repetition, progression, transition and contrast. Repetition is the use of the same element or elements of pattern, color, texture or line more than once in a space. Progression is taking an element and increasing or decreasing one or more of its qualities, usually its size. Transition is creating a smooth flow for the eye where it is gently drawn from one area to another, as with the use of a curved line in an archway or a winding path in a landscape. Contrast is simply putting two elements in stark opposition to one another, such as black and white pillows on a sofa. Scale relates the size of one object to the size of another, or to the size of the space in which it is located. The scale of an object must reflect its surroundings so as not to seem too large or too small. The objective of the principle of scale is that objects should be alike or in harmony with respect to dimension or mass. Proportion is the ratio between the size of one part of an object to the size of another part, or to the whole, or between different objects. This is a design concept rooted in ancient theory and practice with the Golden Ratio and the 60:30:10 rule. Similar, but not related theory and practice, are the Rule of Thirds and Rule of Threes. The concept of proportion, which is about what pleases the eye and imparts design impact, is very important and a subject all on its own. 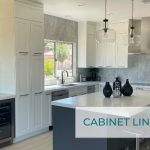 At Cabinets of the Desert we hope to benefit our clients by bringing awareness of these design elements and principles to our cabinetry projects. We also bring our own intuition and experienced eyes.